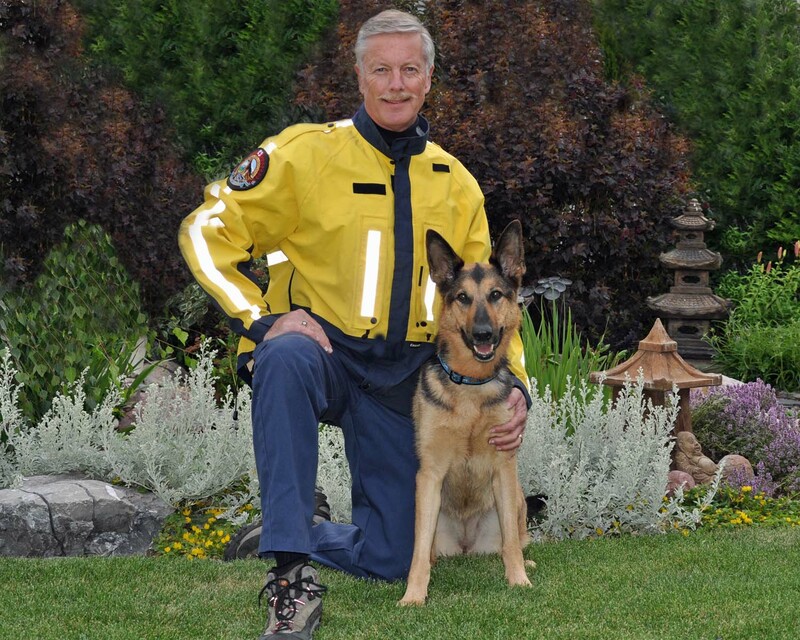 I am thrilled to announce that Team Tango passed their annual RCMP cadaver certification this morning. As a reward, Tango got a Mega-P’nut treat from Bone and Biscuit in Sherwood Park and Don is going to get a nice ‘take-out’ dinner from the restaurant of his choice. I think Tango got the better end of this deal. 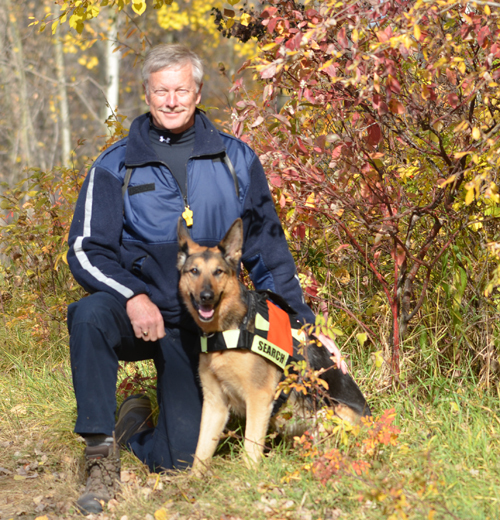 Don and Tango passed their annual RCMP certification test today. Although it has been raining non-stop all day they went ahead with the testing. The large articles have been laying out in the test field for two rain filled days, but Tango found them all. The people search was picture perfect and a thing of beauty. She hit on the scent more than 75 yards away. They were tested on 4 profiles today: large articles, small articles, people and alleys. Their cadaver test will happen this fall. I wasn’t allowed to watch the certifcation tests because I am too much of a distraction for our girl. While she is searching she likes to do a ‘run-by’ just to say hi to Mom. I’m so proud of them. We are going to have a celebration dinner tonight!!! 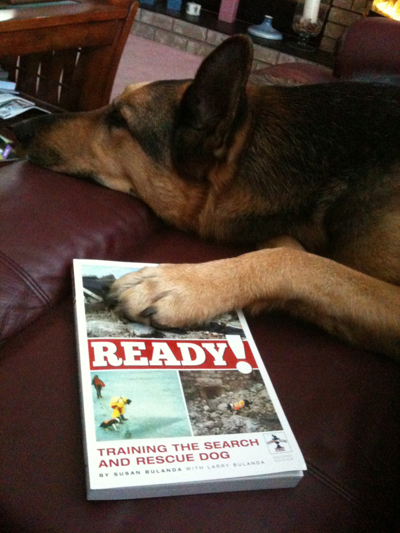 I got Don a book on search and rescue training for his birthday. He had been reading it and when he took a break, he put it down on the couch beside him. Next thing we know, our search girl has crawled up beside him and put her paw on the the cover of the book. It was such a perfect photo opportunity that you would almost think that we posed it…..but we didn’t. 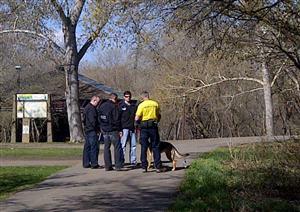 Team Tango continued their search in the River Valley on Tuesday. It seems like every picture and video that has been taken of the search features Don’s rear end. People are starting to tease him that that is his best profile. We hope that the search will provide some closure for the many families affected by the large number of missing women in the Edmonton area. Here is a new link to an Edmonton Sun article. Again….I don’t know how long these link will be active. On Friday morning there was a news report about hunters finding a human skull. 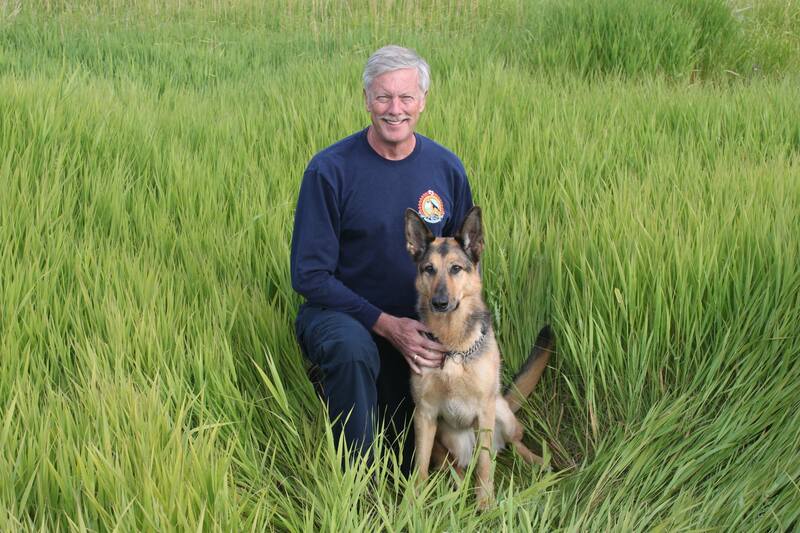 Within hours the request came for cadaver dogs to search the surrounding area to see if more human remains could be located. 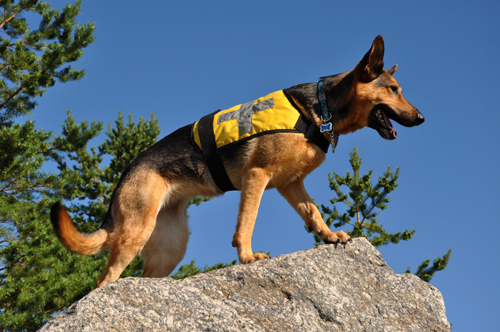 Team Tango left the house very early this morning to aid in the search.